(25 cm x 30 cm) up to 44 inch x 8 ft (112 cm x 3.2 metres). These images are printed using a twelve-colour Canon Large Format printer using archival quality Pigment inks. Unlike dye prints which fade after a few months, the Canon Pigment technology delivers prints with an indoor display life estimated at 100 years. 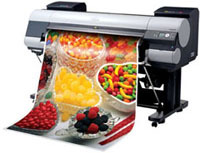 Prints from this machine are made on a variety of Matt, Satin or Gloss papers ranging from 80gsm to 300gsm as well as 380gsm water resistant Artist's Canvas, self-adhesive vinyl (suitable for car doors, truck side panels, etc.) and back-lit film suitable for light-box advertising applications.